As a follow-up to my previous post on "Deconstructing Klout Topics" published 4 days ago (January 13, 2012), I thought it might be helpful to show how the test has progressed. Late last night at approximately 10:30 pm (yes I was checking every 4-6 hours for changes) the topic "social media measurement" appeared in the blue sash on my Klout score. Yet during the day I received not even one additional +k on that topic. So what changed? I received the last +k on that topic on January 12 in the morning and according to Klout that brought my total to 10 according to Klout (since I started this test on January 12th), yet before the last +K was given I was also at 10 so obviously a technical issue on Klout's end for not upping the count. Regardless it moved me to position 59 between Perrier Pelser #58 with 10 +Ks (http://klout.com/#/BerriePelser) and Jeannette Baer #60 with only 9 +ks (http://klout.com/user/MyAgenda) and to my surprise Perrier also didn't have the topic on his slash either but Jeannette did. 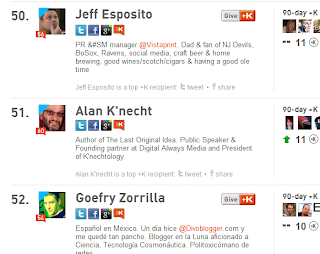 This morning when I checked (after the nightly Klout update), the count of +k on this topic was correct at 11 and I had moved up to position 51 between Jeff Esposito (http://klout.com/user/jeffespo) and Goefry Zorrilla (http://klout.com/user/goefry) both of whom have the topic of "social media measurement" as part of their blue sash. Now while I able to garner the topic in my blue sash, Perrier Pelser still doesn't have it as part of his blue sash, but he has been granted since yesterday a yellow sash for "Social Networks" (meaning Klout has determined on it's own that he is one of the top 20 influential people on this topic) which clearly shows that Klout has updated his sahes. As of writing this he's now in position number 59 and topic "social media measurement" for both of us, is still rated as High while for some lower in the list (fewer +k) it is rated as strong. What might I have done that Perrier Pelser (aka Ber|Art WordPress ) didn't do, that I now deserve the blue sash? While I have been paid little to no attention to his on-line activities, I've made it a very conciousness decision to write the previous blog post on social media measurement, I've talked up a fair bit a conference keynote that I'm going to deliver next week on the subject of "Social Media Measurement" across multiple social media platforms that generated many retweets, shares, G+ and likes. The result, I got recognized that I do yield some influence on this topic while Perrier most likely kept doing what he does and garnered a yellow sash on the topic of "Social Networks". 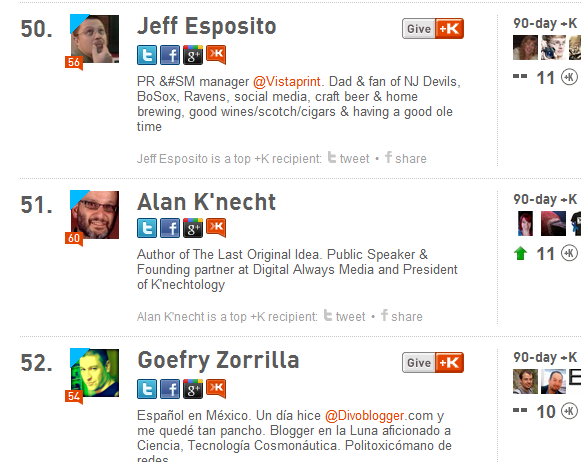 So what conclusions can I make from this test as how Klout Topics are influenced by the giving of +k's. 2. If Klout doesn't think you influence on a topic and you or someone else adds the topic to your list it isn't going to get you the blue sash unless you can truly demonstrate you actually yield some influence on the topic (as determined by Klout). I think this is an excellent position for Klout take and should stop people from topic bombing Klout for bragging rights or for whatever value they see in the blue sash. And if you do truly think that you do yield influence on a specific topic that Klout hasn't assigned you, then yes get lots of +k on the topic, but adjust how phrase things to actually focus the the topic. If you want to keep helping with this experiment, please be sure to G+, share, like and tweet out this blog post plus don't forget to give me a +K on the topic of "Social Media Measurement". Also give it a try yourself and let me know how your results compare.